BRIGHTON Primary School’s Jye Martin, recently entered an Australian writing competition and won. The competition was called the Australia Post ‘Raise a Reader’ competition in the Mercury newspaper requiring him to write about someone who inspires him, and why. Jye Chose North Melbourne’s Shaun Higgins and while there were a large number of entries in the competition the judges recognised his as a stand-out. Plus he wrote this in his own time in the holidays. 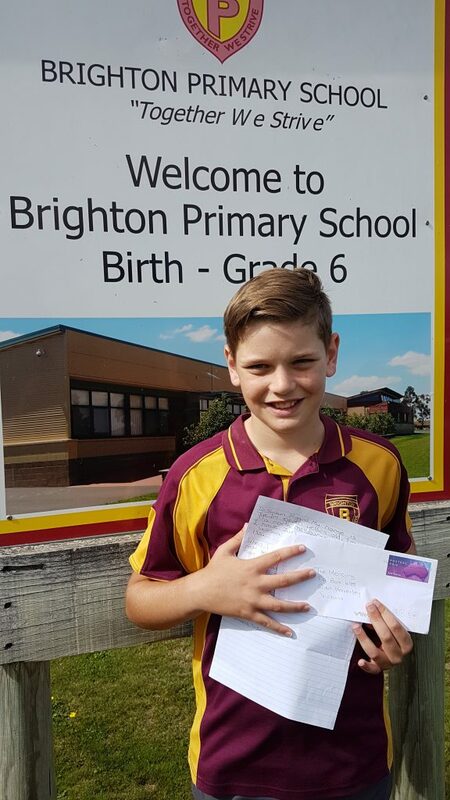 Brighton Primary School’s Jye Martin proudly displays his letter advising him of his win. We have been working this term on looking at people who inspire us and how we can be a positive member of our community and it would be amazing if his efforts could be recognised beyond just the school newsletter. It would also be an awesome celebration of his writing. “During the summer holidays I entered the Raise a Reader writing competition from the Mercury newspaper. The competition asked students to write about an Australian legend who inspired them. I chose to write a letter to Shaun Higgins who is my favourite football player from North Melbourne. I wanted to write about Shaun because I admire how he can kick on his right and left foot and he is fast through the midfield. His determination inspires me to try my hardest for all four quarters when I play footy for my club, Lindisfarne. Well done Jye on such a fantastic achievement.